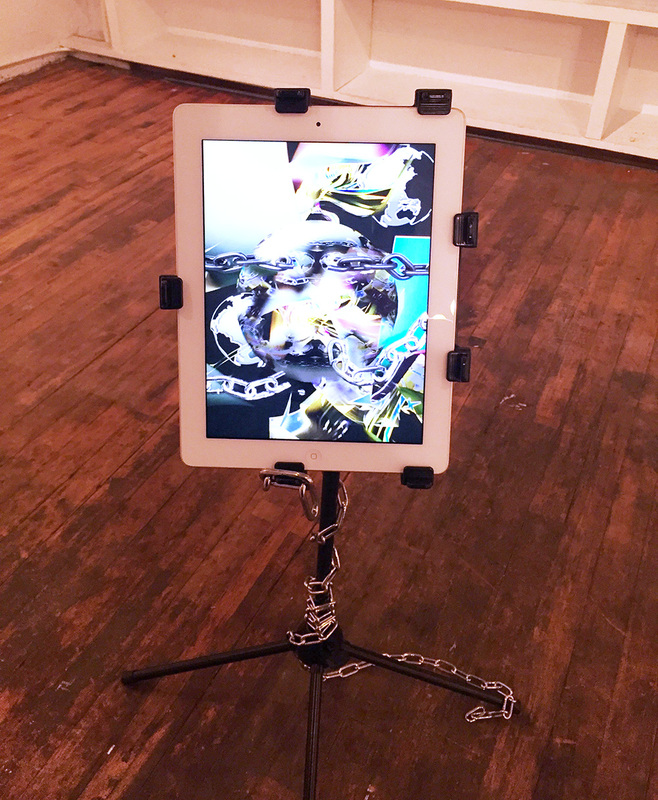 Bay Area based artist Devon Makoto Lei presented a series of new works that explores the embodiment and disembodiment of our digital existences - our social media personalities, cyber aliases, and our myriad relationships with screens and the 4th Dimension. Ireland-based artist Jennifer Mehigan showcased new prints on fabric, two new video works, and joined us for a panel via Skype from Singapore on opening night (excerpt from panel in video above). In a society where cyber egos and followers are prevalent and powerful, it is important that these things be discussed. As reality and the virtual collapse into one, it is the age of digital-dualism. They need to be presented to people in real time. 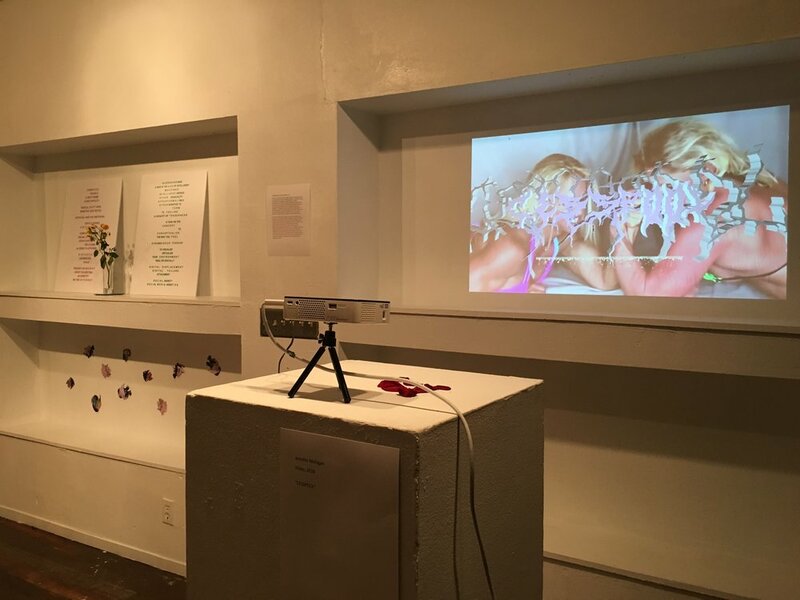 The goal of my work is to allow audiences to come face to face and be questioned about the comments they make online, their augmented edited selfies, their effect on our capitalist society, the alternate version of human consciousness we've become so obsessed with, and the Internet fame that creates an ego in the physical world. 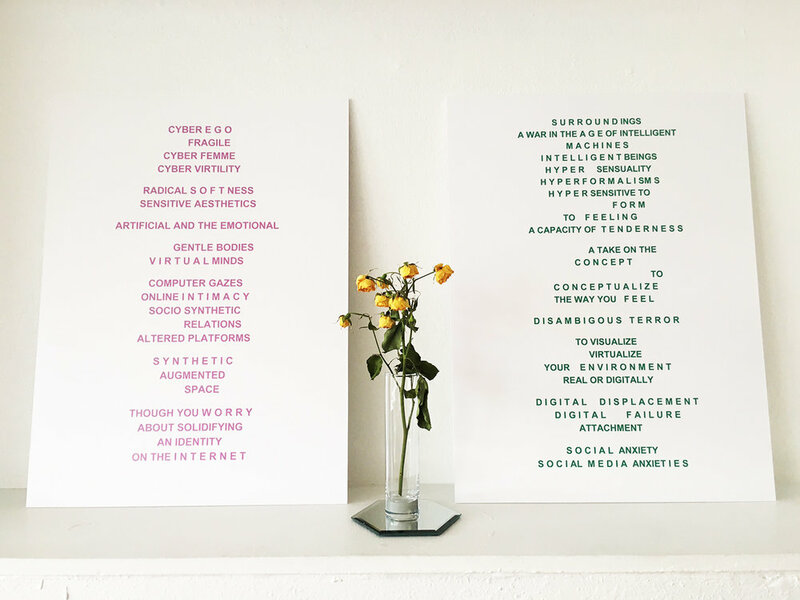 My hope is to present these overlapping elements in an immersive setting through CGA (computer generated art as opposed to imagery) and digital sculptures representing the progressive mind." "'Femme' and its association with cuteness and beauty is often perceived as excessive artifice next to the 'neutral natural' nature of masculinity. Mehigan's works hone this uncomfortable facet of the feminine and push it to its edge. Digital files begin as recognisable bodies and forms (flowers, rocks, organs, bacteria) and are disintegrated into non-entities printed on fabric canvases. The result is a distilled aesthetic that is abstracted, unrecognisable yet somehow familiar, and capable of infinite reproduction. Compounding these elements to the extreme and combining them with the trappings of the feminine (glitter, petals) and the grotesque (flies, worms) creates an uncomfortable excessiveness within the exhibition space that serves as a brand of violence unto itself, simultaneously rebeling and reclaiming both space and body. As Mehigan succintly adds, "It's like being aware of the 'drag' element of femininity, and weaponising that, pushing it further, to the point that it's ugly and appalling but cute and fun still."